TWINS! BOYS! 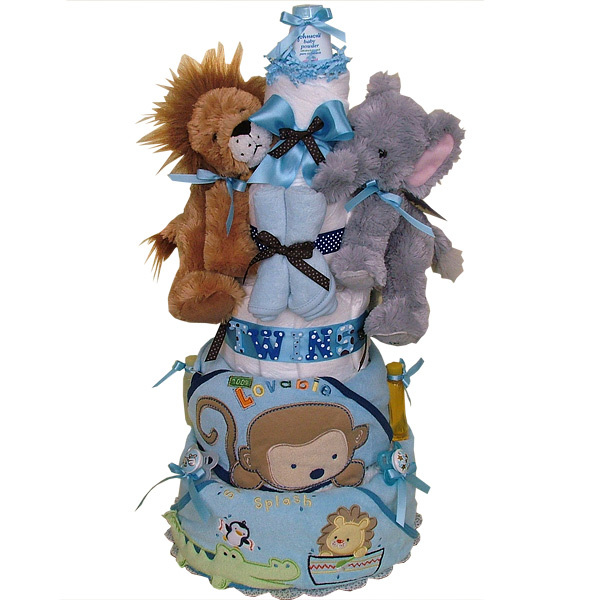 Elegant and practical, handmade, HUGE five tiers Diaper Cake will be the best gift at the baby shower! This cake made of 70 Pampers Swaddlers diapers size 1-2 (up to 15 lbs. ), Two hooded towels by CARTER'S, Two washcloths, Two MAM pacifiers 0-6 months, Two Shining Stars plush toys by RUSS one lion and one elephant, One JOHNSON'S Baby Powder Pure Cornstarch with Aloe Vera & Vitamin E (Gently absorbs excess wetness to keep skin dry and soft) 1 1/2 oz, One JOHNSON'S Baby Shampoo (This mild, tearless formula baby shampoo is as gentle to the eyes as pure water) 1.5 fl oz, One JOHNSON'S HEAD-TO-TOE Baby Wash (Bathe your baby in pure gentleness) 1 fl oz, One DESITIN Creamy (A creamy formula with Aloe & Vitamin E to prevent and treat diaper rash) 1/8 oz, One JOHNSON'S SOOTHING NATURALS Nourishing Lotion (Moisturizes for 24 hours to give lasting relief to uncomfortable dry skin) 0.2 fl oz. The diapers are held together by elegant ribbons (no glue on diapers). Ribbons are hand-stitched with white embroidery floss on the back of the cake, allowing for a clean, handmade look. Decorated with hand-painted wooden letters, ribbons and bows. This cake sits on 12" Wilton cake circle and it's more than 24" in height. Comes wrapped in cellophane with coordinating ribbons and bows. All our diaper cakes made of highest quality ingredients with greatest care and love. Everything included is ready to use and easy to disassemble.